Uglyworld #438 - Cinko's Happy Faces (96-365), originally uploaded by www.bazpics.com. Cinko has been waiting quite some time since Babo brought him back the pack of Happy Faces biscuits from Cambridge in England, but this morning when Wage shared the news about their dogs finally being released for travel from America he decided that this was the perfect moment to open them. 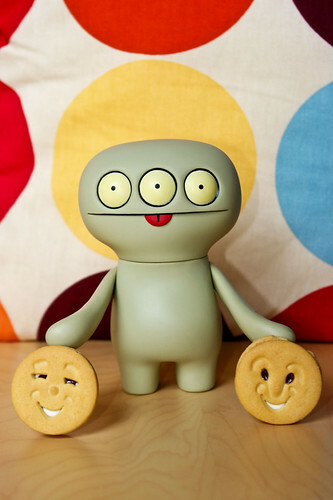 Whenever you look at Cinko he already makes you smile with that awesome face he's always pulling, but add to this a pair of tasty Happy Faces biscuits which have a jam and cream filling inside and you're on a whole new level.